Just like many things the shower has come a long way in the last few years and for many in our society, the shower is a great way to start the morning, quick and convenient. We have a huge range of showers and showering equipment at our web pages and all of these will make the sort of statement that suits you. The St James is an exposed shower set and takes us back to a time reminiscent of when we may have seen Victoria or Edward VII on the British throne. The generous five inch (127mm) shower rose which is fitted to a mounting arm and with a matching exposed riser and arm, the shower is operated by retro styled taps which are inlaid with white ceramic marked hot and cold in traditional typeface, the handle offers full and easy access over water flow and temperature. This set combines the pleasing aesthetics of a bygone age with the durability of modern construction methods. In contrast and thoroughly modern looking the Mira Vision High Pressure Digital Shower Mixer offers full control over the shower, this allows the user to select one of the programmed settings giving the perfect temperature. The thoroughly 21st century Mira has wireless, digital controls allowing the shower to be set in advance of usage with settings for eco and warm up, as well as full thermostatic control. This allows all the family control of safe energy use and a safe temperature limit. The Mira 360 head has four different spray settings to give a rich and varied shower perfect for the modern bathroom. Another example of a modern shower, the Origins Fusion range brings a distinctly modern aspect to the bathroom interior. The neat three valve control set with a fixed arm the controls operate flow and temperature as well as acting as a control for diverting the water, this neat panel conveniently hides all the plumbing. Supplied with two different sizes of shower rose, either 200 or 250mm, although modern in outlook the exposed pipework does give an early twentieth century look to the design. Completing our quartet of showers and showering equipment, the Vado Soho Four Hole Mixer Set is a bold and contemporary take on bathroom arrangement. This truly modern set comprises bath filler, hand set, single lever operating valve and a diverter switch, perfect for a modern bathtub. Stylishly finished in chrome, it makes cleaning both the items themselves and the surrounding area easy giving a clean bathing area in modernistic style. The single lever tap operates both bath and shower functions, with the deck-mounted diverter switching between the two functions. Shower heads that are made to impress! A shower head is a functional device that is seen on every shower, but it can be very striking too, so why not take a look at these fantastic shower heads that were made to impress. We illustrate just three of these and for a shower head that will get your family and friends talking, the Pegler Star fixed shower head & arm is guaranteed to do that. This chrome head is modernist in design, but above all it is very functional as well as being contemporary. The shower head offers the user four different choices of spray pattern; this multi-mode shower head produces a gentle stream or a torrent of refreshing water, all dependent upon the preference of the user. The Pegler is unique as well as being very attractive, perfect for any size of shower enclosure certain to be modern and appealing, but very easy to clean. As with all Pegler shower accessories and fixtures, this shower head comes with a full five-year warranty from any manufacturing defects. Another modern looking shower head but with a difference is the Hansgrohe Raindance Rainfall 180 Air 2jet Overhead Shower. Whilst this shower head is guaranteed to make an impression to all who see it, above it is the two different spray settings that will impress the user. The Flood Jet gives a wide, generous spray to ensure a relaxing soak, while the gentle blend of air and water of the RainAir gives a more relaxing, mist-like experience. A water pressure of 2 bars is necessary to enable the system to work and the head is offered in either white or chrome finish. The third of our choices is the Grohe Rain Shower F-Series Celling Shower and is designed to give the user a customised shower experience. It has been cleverly designed to be almost invisible and because it uses GROHE’s brilliant DreamSpray technology, this distributes the spray evenly and efficiently across the nozzle, and is very easy for the user to adjust for perfect flow rate. What is important in any shower head is the ease of cleaning and the GROHE is designed for that, add to that the SpeedClean system, this will ensure that her is no build-up of timescale. Simpsons are a member of the Crosswater Group and they have been manufacturing a wide range of shower enclosure as well as classic bath screens. For over 20 years and in that time they have built up a reputation for unprecedented quality. An over bath shower are an ideal way to include a shower to a bathroom, where it may not be possible to include a shower enclosure and to make the experience of showering better, a screen rather than a simple curtain and the Simpsons Design Semi Frameless Triple Bath Screen is a perfect example of having a bath screen that compliments a modern bathroom. The screen is manufactured using toughened 6mm glass, which has been coated with Clearshield which will ensure that it always remains pristine in appearance. We offer a choice of either a space-saving foldaway design to a hinged triple bath screen all at our unbeatable prices. If your bathroom or en-suite has an alcove, a perfect way to include a purpose built shower is to use the Simpsons Classic Hinged Shower Door & Inline Shower Panel, this is guaranteed to not only give the shower a stunning appearance, but also a very modern look as well. The hinged door as well as the panel itself has a silver finish and the panel has a tough 8mm glass that ensures safety and stability. For peace of mind Simpson offers a lifetime guarantee, which will ensure that this as well as the quality of design makes the shower door and panel a long lasting investment for your bathroom. Perfect for a wet room or walk in shower, the Simpsons 10mm Single Fixed Shower Panel is constructed with 10mm safety glass and the panel will give you a perfect and simple way to create a walk in shower space. At two metres high with the option of no less than ten widths ranging from 300mm to 1200mm there will be a panel which is just right for your project. This pure sheet of glass has been successfully installed in a variety of differently sized bathrooms and it is fitted to the wall with strong yet discrete chrome fixings It can be used with a variety of shower trays or you can fit this directly to flooring tiles. We believe that a power shower is a great assert for any home, we illustrate a number of these ultra-modern showers which have their own dedicated pump, so your power shower will dispense high pressured water with every use. Often a conventional shower can be a poor experience if the water pressure in your home is low and this may be particularly so if the shower is used at a high water temperature. We display at our web pages a number of power showers and many come with different shower head attachments, varying flow rates and other individual features. Check through the web pages under power showers and we feel sure that you will find one that will fit your particular budget and requirements. We will be happy to discuss with you any queries that you may have about a particular power shower. So if you are looking for a new showering experience, take a look at the Bristan 1500 and by choosing this user friendly shower, your new showering experience is just a touch of a button away. With house prices being fairly dormant and many reports showing a decrease in the asking and subsequent selling price, now is perhaps the time to stay put and to undertake some renovations. Estate agents confirm that the bathroom and to some extent the kitchen, is one of the biggest selling points in many houses, so a makeover in the bathroom will pay dividends when house prices stabilise and you do decide upon a move. Modernising your shower or installing one is sure to be a big selling point; the trend away from baths is fast growing and more people than ever prefer to start the day with a refreshing shower. The Rainshower are very much in vogue now and fitting a Grohe Jumbo Rainshower can be a winner. This is no shrinking violet, but a 400mm head with no less than 252 nozzles to provide a true rainstorm effect; it also has an inbuilt anti-limescale system ensuring a clean sparkling head. The head will work for as little as 0.5 bar, but 3 bar is the optimum. Fitting a booster pump will increase the pressure at the head and we will be happy to discuss this option. A double basin has that luxury hotel look about it, very contemporary and when built into a vanity unit you not only have the look, but you have plenty of space in the cupboards as well. These improvements will not cost a fortune, particularly when you check out our unbeatable prices. Through our research over the past few months we have found that men and women have different ideas when it comes to bathroom design, the South East has the most expensive bathrooms and found what people think the bathroom of the future should include. In our latest research we asked 1,718 UK residents who owned their own home for their ultimate wishlist of features for a luxurious bathroom. Participants were then asked if their current bathrooms had any of the features that made the top 5 wishlist. Only 23% of those polled said that their bathroom had one of the features, leaving the remaining 87% to dream about owning them. All of our respondents were then asked if they would pay more for a property that had a luxurious bathroom, to which over two thirds (68%) said yes they would. Those who said they would pay more said that they would be willing to spend up to an additional £7,500 on a property with a luxurious bathroom. Every day we see more products that are entering into the digital age that can be used in our bathrooms and the very latest which we have added to our portfolio is an exciting Crosswater product for use in the shower. We have a number of new Crosswater items at our web pages which are very much 21st century and we have to say that we are all very impressed with this new shower controller. The Solo pack illustrated is a simple single control which adjusts a single interface and processor unit. The control indicates a different colour for the temperature of the water, cold is blue and as the control is turned it changes through various shades until the maximum is obtained, naturally this is red. The unit has an inbuilt memory and with retain your preferred settings up to a maximum of three. We offer three options for the Crosswater Digital Solo Single Shower Controller and these are the single hand operated controller, the same hand operated controller but with a pump and a remote control so that the shower can be operated outside of the shower cabinet. At our web page a video is available to demonstrate the ease by which the Solo is operated and if you combine this with one of the Crosswater shower heads with LED lighting, the result can be pretty spectacular. The shower bath is an ideal solution for a bathroom where it would be difficult to have a separate shower cubicle. The “P” shaped bath allows the user plenty of space in which to move around whilst taking a shower without being intrusive in the bathroom. There is another advantage to having the Essential ‘P’ Curved Shower Bath Pack as it allows more room to stretch out and also give plenty of elbow room to the user. 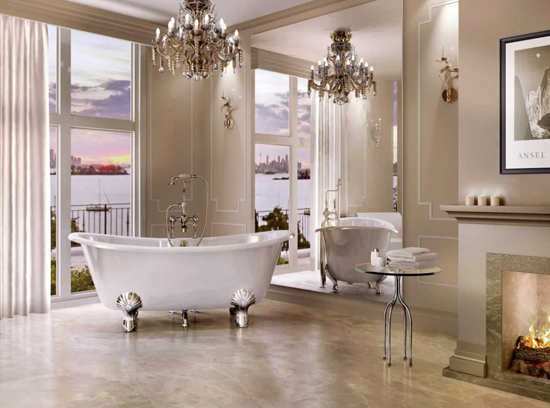 These baths are luxurious and have been designed with comfort in mind for the bather and room for taking a shower. They are moulded in high quality Luctite acrylic and the bath is available in either left or right configuration. The material is warm and very easy to clean and has the benefit of a five year guarantee. The package also includes an elegant toughened glass curved screen to prevent water splashes and also has a chrome towel rail fitted to it. The bath is available in two sizes 1500(w) x 750/900(d) mm or 1700(w) x 700/850(d) mm in the case of the end of the bath not being fitted close up to a wall a matching end panel is available from the extras list with a fitting kit and water seals included in the package. The 1700 version complete package is available from us at a discounted price of just £329.95 which is a massive saving of 58% on the recommended price of £780.00 saving you £450.05; we are never beaten on price at UK Bathrooms. En suites provide a private area to wash and groom away from the main bathroom and are great for busy families and lifestyles. In this article we’ll show you some of our favourite products for creating the perfect modern en suite, that won’t break the bank. The Simpsons Design View Shower Enclosure is sleek and stylish, and built to last. It’s clean lines and durable 8mm toughened glass make it ideal for an en suite, and it also features a reversible door making installation and positioning easy. Measuring 1400mm x 900mm and 1950mm high, the Simpsons Design View Shower Enclosure makes a perfect focal point for any modern en suite. It also features a lifetime guarantee for peace of mind and is finished with a silver frame. To finish off your shower design, you can’t go far wrong with the Crosswater Solo Fixed Shower Head. Elegance by Crosswater: a mix of traditional design and contemporary styling making the most of your new bathroom. Wall or ceiling mounted, this elegant shower head provides the best showering experience thanks to its integrated air-fusion system. This quality shower head is engineered and manufactured to exacting standards, and comes complete with a 15 year manufacturer guarantee. The Ideal Standard Concept Cube Basin is perfect for any en suite and can be fitted with an optional full or semi-pedestal and has a choice of 1 or 2 tap holes. Available in gloss white, this basin was designed by award winning designer Robin Levien and comes with a lifetime guarantee. Offering outstanding value for money, the Ideal Standard Concept Cube Basin is perfect for small bathrooms and en suites alike. Another great statement piece, the Phoenix CA Series Basin Mixer Tap is the pinnacle of style and design. Ideal for both high and low pressure systems, this mixer taps unique design and waterfall effect adds to the visual appeal of your en suite. This tap is also eco-friendly and comes equipped with an Enviro-Click cartridge, which can save you up to 50% of your water. It is also backed by a 10 year manufacturer’s guarantee for peace of mind. To match in with the basin design, we have chosen the Ideal Standard Concept Cube toilet. Its compact design makes it a great addition to any en suite and comes complete with everything needed to install it straight away. Designed by the legendary Robin Levien, this stylish toilet has a soft close seat and push button flush to save you water. This toilet features a lifetime guarantee on the pottery so you can be sure of many years of service. The Noble Primo Aluminium Illuminated Mirror Cabinet is lightweight and easy to install. It features a low voltage overhead light for better visibility and an inner shaving socket. It’s compact, yet stylish design is great for small bathrooms and en suites, and is perfectly suited for other Noble Furniture products such as wall units, vanity’s and freestanding units. Using electric showers in thye summer months makes complete sense as often the heating systems are turned off completely and it is possible to have a hot, or warm shower without difficulty. However having an electric shower makes complete sense whenever it is used and the installation of them is simple, a cold water feed and an electric supply. UK Bathrooms has a full range of electric showers from which you can choose and the Mira range has some excellent choices. A top selling range in Mira is the Vie model and here you have a choice of power outputs to suit your personal requirements. These include including 8.5 kW, 9.5 kW and 10.8 kW. And there is an ECO setting ideal for summer use. In addition the Mira Vie electric shower system comes with a built-in select and forget control panel. This panel allows you to create shower settings, such as temperature settings, that can be reused each time with just a push of a button. The finishes include chrome, white and satin.